A successful surrogacy journey is, in itself, a gift for everyone involved. But traditionally, gift-giving is a very common custom – many surrogate mothers and intended parents have the desire anyway to give something to the other. It might be a symbol of their friendship, a memento of the experience, or just a thank-you. The gifts don’t have to be expensive – after all, it’s the thought that counts. Here are some suggestions. One of the ideal gifts to give to a surrogate mother on the first meeting is something personal and home-made – baked goods, for instance. Another good gift is something for your surrogate’s children; coloring books or small toys might be a good idea. 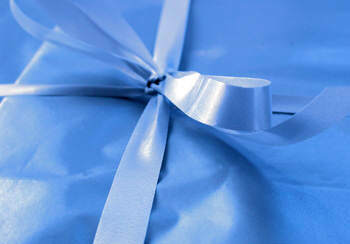 The really important rule for gifts at the first meeting is that it should be something thoughtful, as opposed to something expensive – really, an expensive gift is only going to make the surrogate uncomfortable. This is another good time to gift your surrogate. It’s important to remember that the gift should be symbolic of the embryo transfer, or the future pregnancy. Some ideas might include fertility charms, surrogacy T-shirts, maybe pregnancy test kits bundled with pregnancy-related items. Another angle to take could be paperback novels, DVDs, or a gift certificate to a local delivery restaurant – something to keep the surrogate mother happily occupied while she’s on bed-rest after the embryo transfer. Gifts during pregnancy are often a good idea – regularly, on some occasions, or just once. This is an area where it’s especially important to consider the surrogate’s own personality and needs – some suggestions might be gift certificates at a local restaurant, gift baskets with bath products, or a certificate for a spa treatment. This is the best time to give something to your surrogate mother. The gift doesn’t necessarily have to be expensive – it’s more important to celebrate the occasion. Sentimental gifts – mementos – are the best kind; ‘name a star’, bonsai trees, perhaps an album as a keepsake. Other gifts might include something for her children,or gift certificates that she could use post-pregnancy.